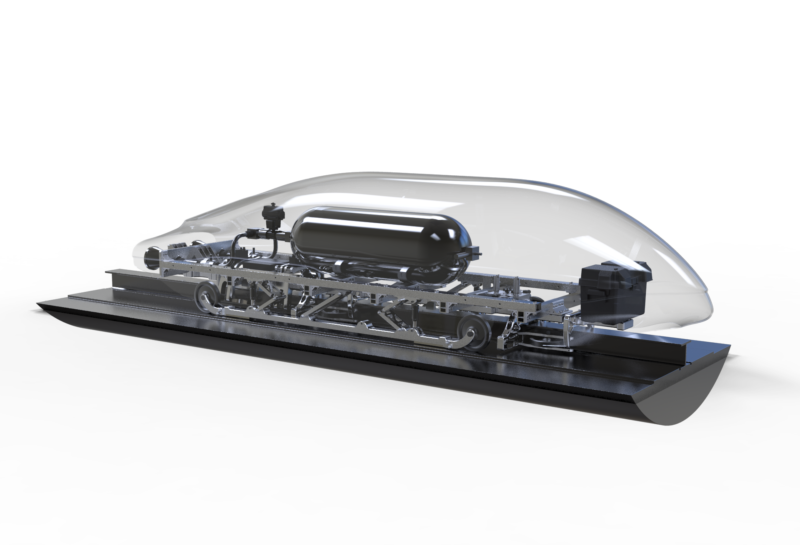 In 2017, Swissloop took part in the Hyperloop Pod Competition for the first time. Our pod “Escher” was named after Alfred Escher, one of the most influential Swiss citizens of the nineteenth century. It features a propulsion system based on compressed air that exits the pod at low temperatures and expands at the nozzles, thus providing a rocket-like acceleration. The system has been tested with pressures of more than 200 bar. Permanent magnets for levitation reside in the pod’s skis and lower the center of gravity. Escher’s breaking system relies on hydraulic pressure. It allows for the pod to safely brake at up to 400 km/h. Our dampened wheels provide lateral stability to the pod. Out of 1’200 competitors, Escher reached third place in the Hyperloop Pod Competition in August 2017. The cold-gas propulsion system was certified safe by SpaceX, making Swissloop the first team with a “rocket-style” system to get approval by the world’s most successful private rocket launching company. Our electronics box acts as brain of the prototype – holding our self made PCB and connecting to a multitude of sensors. The stabilising wheels make sure that Escher stays aligned when moving along the Hyperloop track.